While the Punjab Cabinet subcommittee today gave approval for the recruitment of 94 medical and dental teachers, besides 474 other employees such as nurses, operation theatre assistants, ward attendants etc in the Government Medical and Dental Colleges, the authorities concerned have set in motion the process to dismiss 48 nurses, who have been absent from duty for long. Travelling in the state-owned Punjab Roadways and Pepsu Roadways Transport Corporation ( PRTC) buses is all set to become costlier if the Council of Ministers gives its nod to a proposal to a hike in the bus fares in the state. The fact-finding team of the Shiromani Akali Dal (Amritsar) today identified the SGPC employees, including a gurdwara manager, who had allegedly thrashed its activists when they tried to stage a protest against Bibi Jagir Kaur , SGPC president at court complex in Patiala on October 19. The Punjab Government has come under severe criticism for not transferring the Deputy Commissioners (DCs) of Amritsar and Gurdaspur before the Shiromani Gurdwara Parbandhak Committee (SGPC) polls. The family of BSF constable Surjit Singh has been offered legal aid by two Supreme Court advocates who read the news report ‘Declared martyr, constable languishes in Pak jail’ in The Tribune on October 5. 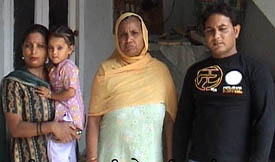 Surjit’s wife, Angrej Kaur, along with her son and grandchildren at her home in Faridkot. “Let’s not allow the next generation to bear the hatered generated by 55 years of mutual acrimony”. This emotional statement was made by the head of Rafi Peer Theatre Workshop, Lahore, Usmaan Peerzada today. 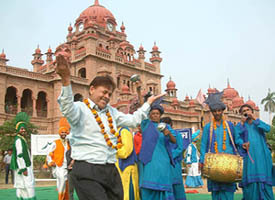 He arrived here along with his 46-member troupe to participate in the Amritsar-Lahore Saanjh Festival being jointly organised with the Punarjot of Amritsar. Humility remains the essence of Pt Jasraj’s character. Even though his profile gets better with every passing day, the custodian of Mewati gharana ensures that he never loses sight of the land. For if he does, his pursuits of musical excellence might seem distant and futile. After all, the higher a person stands the easier he is to uproot. Eleven migrant halwais fell unconscious after consuming “parsaad” of “burfi”, given to them by a fellow migrant, a rickshaw-puller putting along with them in a rented house in Upkaar Nagar locality on the outskirts of the city last night. The Punjab Government has constituted a committee to look into the causes of thousands of seats remaining vacant in the technical institutions of the state this year. Charanjit Singh, a youth belonging to a Congress family of Bahini Baga village of this district, has two fractured fingers following alleged torture by a police official in Joga police station. He had allegedly refused to pay the official bribe to get a gun of his uncle’s released from that police station. A large number of labourers today staged dharna and blocked traffic on the main road here for about two hours in protest against the alleged lathi charge by the police on women labourers at the local grain market yesterday. Staff nurses and pharmacists are fighting with each other for comparatively difficult duty of emergency in the Civil Hospital, Gurdaspur. Dr Inderjit Kaur Walia, Civil Surgeon, Sangrur, called upon private doctors to actively participate in the revised national tuberculosis (TB) control programme (RNTCP) as more than 50 per cent patients of TB initially contact private doctors for treatment. 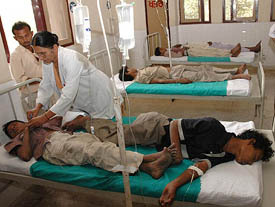 A quarrel between the Additional Deputy Commissioner, Mr Rahul Tiwari, and the District Health Officer, Dr R. L. Taneja, snowballed into a larger controversy as the doctors and paramedical staff resorted to strike and staged a dharna in the Civil Hospital complex here today, paralysing the functioning of the hospital and causing harassment to the patients. People building houses in Punjab have been dealt a blow with the brick-kiln owners’ strike showing no sign of ending and an unprecedented hike in coal prices at the same time sending brick prices spiralling. A commemoration parade was today organised in the local police line to pay tributes to all those jawans and officers of Punjab Police, who sacrificed their lives to maintain unity and integrity of the nation. Punjab farmers might be on cloud nine after harvesting a good quality paddy crop, but it has left a sizable number of people from Bihar starving. They arrive in the state every year hoping to make some money through the residue of paddy after harvesting is over. In a piquant situation, 24 shopkeepers who encroached on municipal corporation (MC) land by covering the area in front of their shops and enclosing it with shutters, today sat on dharna in the Rose Garden market to thwart the attempts by the corporation to demolish the encroachments. The president of SAD, Mr Parkash Singh Badal, said yesterday that Punjab Chief Minister Amarinder Singh’s outburst against a section of the media had very grave implications as “it reveals that anyone daring to report the truth about him would be treated as a personal enemy and should be ready for a fight with the CM”. The Punjab Chief Minister, Capt Amarinder Singh, has expressed grief over the demise of Ravi Brat Bedi, a veteran photo journalist, who passed away yesterday in New Delhi following cardiac failure. The Additional District and Sessions Judge, Mr Sukhdev Singh, has sentenced three persons to life imprisonment and two others to seven-year jail in a case of dowry death. Mayor, Vishnu Sharma today recommended the suspension of former Municipal Town Planner (MTP) S.S. Bhatia, at present posted at Ludhiana, to the state government saying the MTP was indicted in a case involving demand and acceptance of a bribe of Rs 20,000 from a shopkeeper of the city. A seven-year-old girl was raped by a youth at Suara village, 14 km from Nurpur Bedi in Ropar district, today. The incident took place when the girl’s parents had gone to attend the wedding in a village and she was alone at home. A farmer, who was kidnapped over a land dispute from Nihal Singh Wala, has been admitted to a hospital after some persons threw him at the house of the village sarpanch last evening. Deepak Sharma, a resident of Garota village, was killed when his car met with an accident with a train at an unmanned level crossing near Sujanpur. Mr M.F.Farooqui, SSP, here on Wednesday said the Balachaur police arrested two miscreants, Bajit Singh, alias Bittu, son of Mr Sukh Ram and Jarnail Ram son of Mr Ramesh Lal, both residents of Bairsian village and a motorcycle, a .12 bore pistol, and two live cartridges, two packets of Rs 10,000 each were recovered from them. A couple sustained burn injuries when some persons allegedly threw acid on them in Bahadur Hussian village in the Ranger Nangal area today. Hosts S. R. Government College for Women, Amritsar, clinched the overall zonal youth festival trophy of government colleges of Guru Nanak Dev University on the concluding day here today. The NCC Directorate of Punjab, Haryana, Himachal Pradesh and Chandigarh was awarded a special prize for “josh” (zeal) due to the enthusiastic participation of its 40 cadets in various activities in the 12-day Special National Integration Camp held in Chakabama in Nagaland recently. Students of DAV College today held a rally in front of its gate to lodge their protest against the heavy and illegal fines being imposed on them by the college management.